You are going to Watch Naruto Shippuden Episode 273-274 English subbed online free episodes with HQ / high quality. Stream Anime Naruto Shippuden Episode 273-274 Online English sub True Kindness. Izumo and Kotetsu arrive and manage to bind Kakuzu. As they ask Ino-Shika-Cho to help seal the constrained Kakuzu, Shikaku interferes and tells them to handle Kakuzu with Darui whilst Ino-Shika-Cho confront their sensei Asuma Sarotobi. 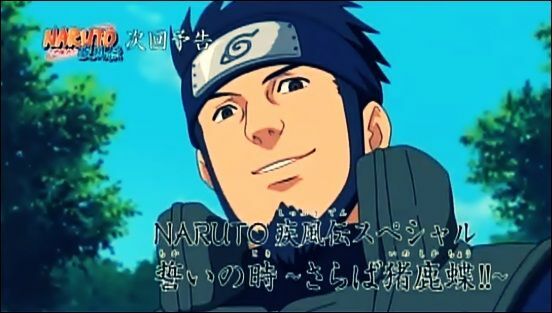 They recall their previous spar with Asuma when they’re genin and Asuma lecturing Choji about his kindness. Shikamaru also recollects his past in protecting his comrades and Ino thinking about Asuma’s last words which she must guide Shikamaru and Choji. Other ninjas try to subdue Asuma but they failed and the Ino-Shika-Cho arrives to face their sensei. They trade attacks but when Choji is about to punch Asuma, he suddenly stops and says that he cannot hurt Asuma. After a flashback of Choji, Asuma begs the trio especially for Choji to stop him.